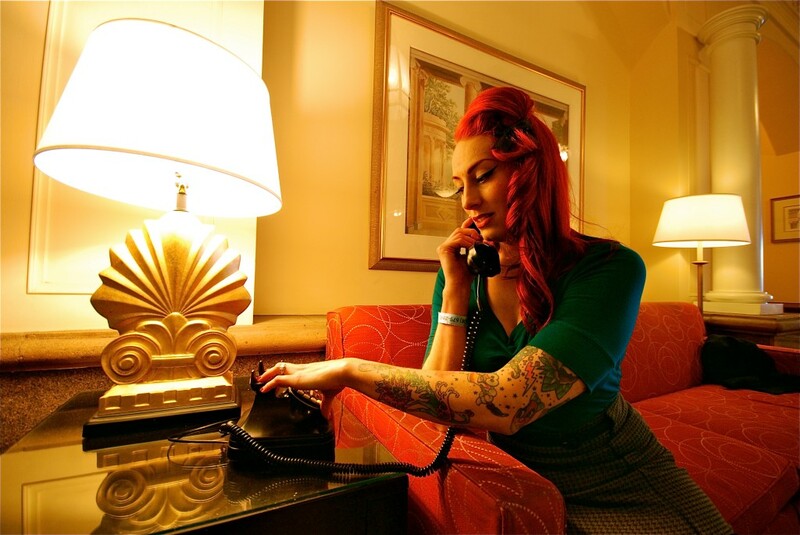 The Embassy Suites in Burlingame, CA played host to this year’s 14th Annual Booze, Broads and Hot Rods (BBHR) sponsored by Kool Cat Kustoms and Hermans Barber Shop. The BBHR show has skipped around locations in the past years, due to its rising popularity, originally starting out in South San Francisco 13 years ago. 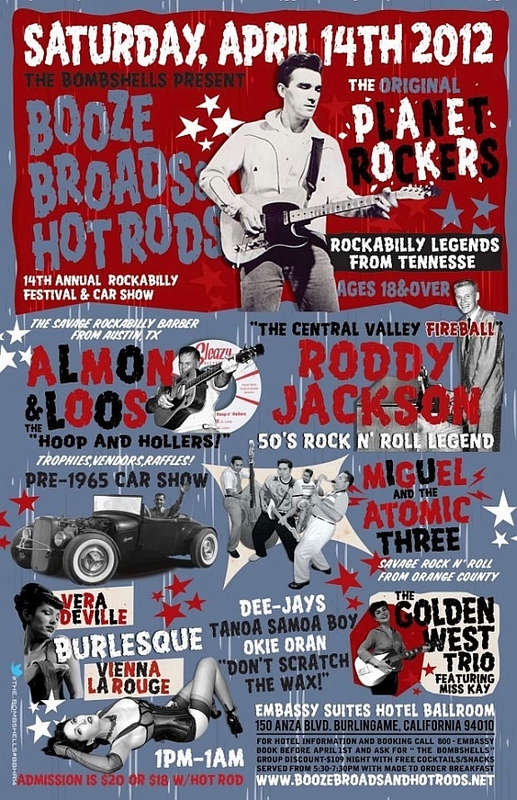 This show has grown over the years to “mark your calendar status” and has also added Rockabilly Festival to its title in recent years. Rightfully so with the talent this show has provided for your listening pleasure. Burlingame is just south of San Francisco and lies right along the bay, so on a beautiful mid-April day like, you will get that soothing, cool breeze coming off the bay all day long. If you plan on attending a BBHR’s show, plan for an all day and night affair because when the Bombshells say it’s a festival they mean it. The show is slated for the whole weekend and it runs from 1:00 pm till 1:00 am. When I say the Bombshells, I mean the group of gals that run the show. 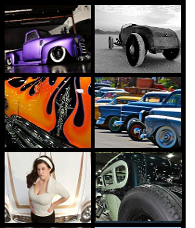 The head honcho Rachelle Hepburn and her hermanas have been involved and highly recognized in the Northern California hot rod scene for over a decade. Being that this was my first BBHR’s show, I did not know what I was in store for. I heard nothing but good reviews on the past shows and I wanted to find out for myself and pass along the good word to all of the MyRideisMe.com readers. Like clockwork fellow lens junkie and Villainz car club member John Lemoine and I sailed out of Concord about 11:00am with all intentions to get to the show early for some quick shoots before the crowd files in. This, like clockwork, was not the case. We hit the Bay Bridge to see a sea of brake lights and no end in sight. Needless to say we weren’t going anywhere for a while. We finally pulled in to the Embassy Suites around 1:15. 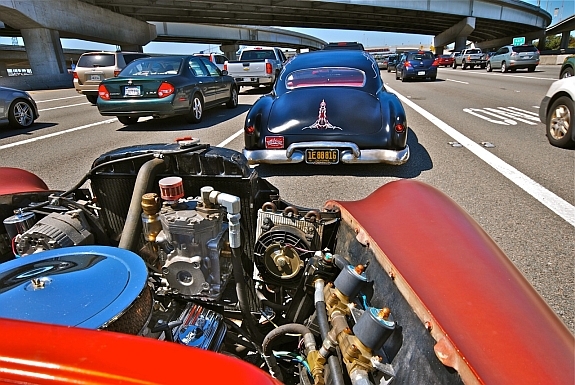 We grabbed a parking stall with fellow Villainz CC Scotty Coppach and his 51′ flamed gem. Let the bags out, hit the asphalt, got our equipment together and headed out for a fun day of shooting. Since San Jose was a mere 20 some miles south of Burlingame and San Francisco was a hop skip and jump north you really got a great flavor of car clubs rolling into the show. In attendance were The Road Lords, The Strangers, The Road Zombies, Style Kings, Viejitos CC, East Bay Sinners and The Villainz just to get the list started. By 3:00 pm I would have to say the parking lot of the Embassy looked full. The last slots where grabbed up by Sacramento’s Skulls CC and Mala Familia CC which officially made it a packed house. As the car show carried on outside with DJ Tanoa spinning tunes, inside was the variety of vendors. 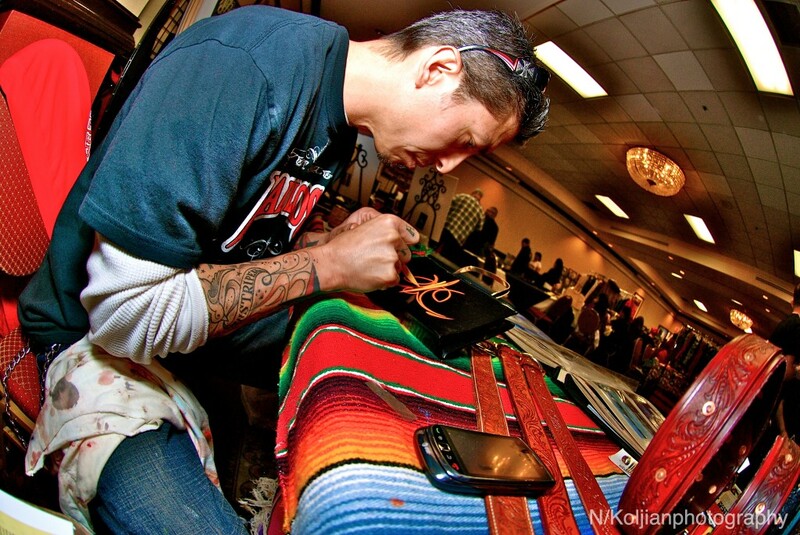 It was a well-mixed with pinup hair styles and vintage clothing to pinstriping art by some of the best. Of course no show can go without grub and drinks and there was no shortage that. Being that it was held at the Embassy Suites, you had full range of the bars and restaurants, not to mention plenty of seating if you needed to kick it for a bit. The ‘Suites also had some great areas for some photo ops! If you were planning to spend the night, like most people, you could look forward to the Burlesque Show that featured Vera Deville and Vienna La Rouge. If that wasn’t your bag, you could go and check out some of the bands that where playing that night like The Original Planet Rockers from Tennessee or Roddy Jackson from Central CA or maybe the two Los Angeles based bands Miguel & the Atomic 3 and Almon Loos & the Hoop & Hollers. Don’t forget from Nevada, The Golden West Trio too. 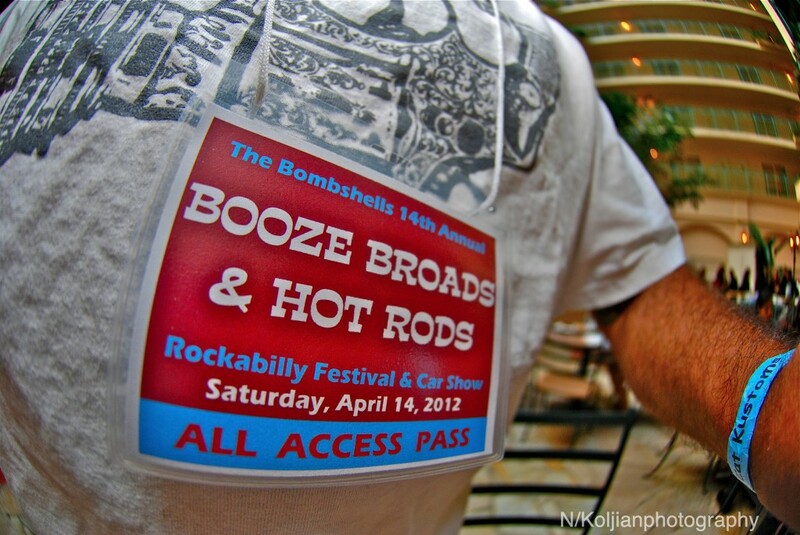 After a long day of shooting the show and a few pinups, we decided to call it a day before the bands hit. We jumped in Johnny’s 49′ and rolled out around 7:00 pm as the show was just getting revved up for the night. 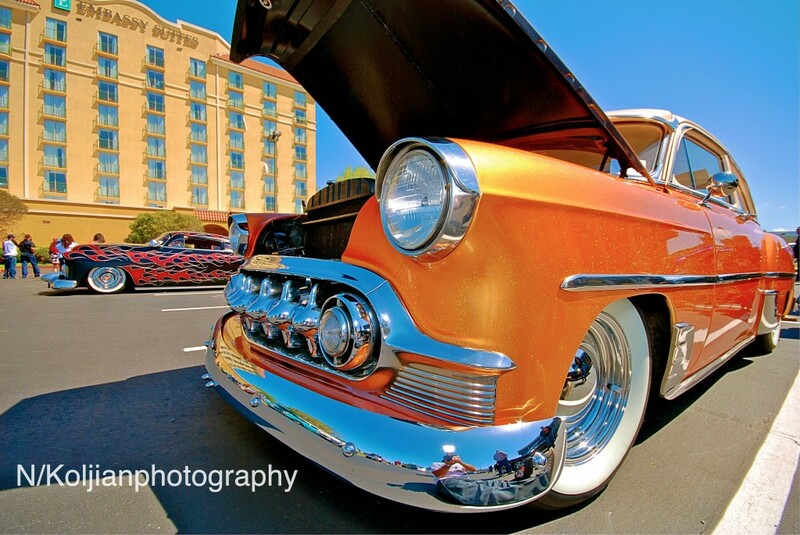 Booze, Broads & Hot Rods # 14 Rockabilly Fest and Car Show was a well put together show. Just the right amount of rods and the parking was ample. You didn’t have to battle for a spot if you came early for registration. A good variety of vendors and plenty of walking room to enjoy all of the booths. A cool set of bands and a Burlesque Show. It didn’t overwhelm you with too much of one thing. The music from the DJ was not over powering so you didn’t need to scream at the guy next to you. The food and drink was easy to get to and there was enough to go around so you didn’t have to wait in line from 2 hours while the awards were being passed out. Sounds like it was an exciting show. I like the look of the hot rods on the highway. 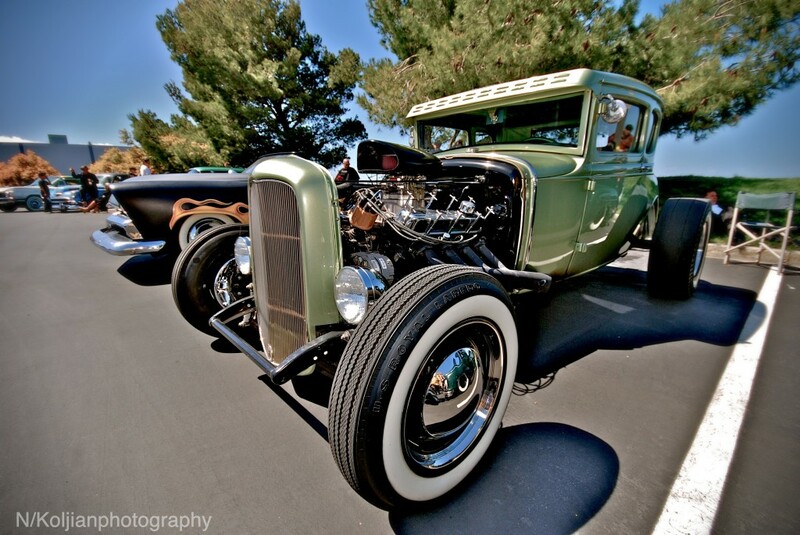 Some sweet rides! Really great pictures as well! !